One of the things that always moves me about Gwendolyn Brooks’ work is her ability to strike emotional chords down to the level of language. This is done in the above poem subtly at the beginning, as the word “gone” is in one stanza and “summer” in the next, only to be brought together in the speaker’s meditation as the compound “summer-gone.” Having this moment build up gradually allows the reader to be in the same space as the speaker, so that when “summer-gone” is repeated in one line, it is an inevitability. I can’t help but marvel at the juxtaposition of the longer, more punctuated line against the shorter line that follows. Here, sentence structure mirrors the speaker’s state of mind, assessing and taking in the “affairs” around her in one line, and feeling a need to “hurry” in the next. This kind of attention to the line fills Brooks’ work with lessons for both the heart and mind. As promised, here is a sneak peek at the cover of my forthcoming collection Everything We Think We Hear, set to be released next week on December 1st. Stay tuned for updates and ordering information. For now, check out “Don’t Look Now I Might Be Mexican” (with audio!) published in Blue Mesa Review which will appear in the collection. I’ve also been revamping the site a bit, making changes to make things more navigable. The more notable changes include the layout of the “poems” tab, which is updated to include some more recent publications, as well as the creation of tabs for “prose” and “tanka & co.” Under “prose,” there are links to book reviews I’ve done as well as posts for the Cincinnati Review blog and writing I’ve done on specific poems for journals (like this one for the Tahoma Literary Review – On “Spiderman Hitches a Ride” – the piece itself to be released next Tuesday). Under “tanka & co.” there are links to my publications in various Japanese poetic forms including this sequence of 39 tanka in Atlas Poetica (PDF). I’ll be working on gussying up the other tabs as time goes on. I tied to strings during a storm. The Inflectionist Review Anthology of Poetry features all the poems from issues 1-4 as well as an interview and feature of Distinguished Poet, Courtney Druz along with artwork from Anna Daedalus and Kerry Davis. Like gradual blindness: each day, more and more, a mix of less and less. the ends of a dress. Singular and graphic. A strong whiskey. A root you cannot shake from your body. The color of the last moon. In a city you do not remember leaving. The Inflectionist Review Anthology of Poetry can be purchased here (and make sure to check out the review’s submission guidelines here). Congratulations to editors John Sibley Williams and A. Molotkov for putting together such a fine anthology! This piece by artist Andrea Schreiber features the kind of dress my mother wore to work at Rosita’s on Baldwin back when I was a kid. As we get closer to the date I plan on sharing the full cover. I did, however, want to share the artwork alone as it is its own special creation. Here are links to the mom-related “Raro” recently published in Compose Journal as well as to The Story Behind “Raro” feature on the piece. One of the most moving things about being a poet and sharing the work I do has been hearing feedback from people. I remember years ago after performing at a poetry slam, I had a woman come up to me and quote a line from one of the poems I’d read: “Why are men only honest during the slow songs?” Then she hugged me and said, That’s it, that’s exactly it. Another time I was working at a coffee shop and had posted some poems (my own and by others) on the community board in celebration of National Poetry Month. It was a lovely surprise to hand off a latte to a young man as he smiled and said: “Solitude feels like fire sometimes.” Did you write that? That’s a good line. My reaction in both situations was a mix of smiling and mumbling, eventually landing on a thank you. In the three years of running this blog, I have been moved to similar moments of smiling and mumbling gratitude by comments made here, Facebook, Twitter, and email by those of you kind enough to read and reach out. While writing and reading may be solitary acts, there is a special kind of communion that happens in those moments of sharing lines and insights. Thank you for making me feel heard! late, late in dour October. The countdown to the December 1st release of my full-length collection, Everything We Think We Hear, continues. Here is a link to my poem “Letter to Rainer Maria Rilke from NYC” published in The Acentos Review in 2010. It’s the piece where the “solitude” line quoted above appears. Just a quick post to announce the release of Puerto del Sol’s latest issue which includes my poem “Meditation on White Hair.” Read my poem here. This issue features fine work by, among others, Grace Shuyi Liew and Yaccaira Salvatierra, whose poem “Longing” won the 2015 Puerto del Sol Poetry contest. Check out the issue here. Special thanks to Carmen Giménez Smith, Savannah Johnston, and everyone else on the Puerto staff for including my work in such a great issue! 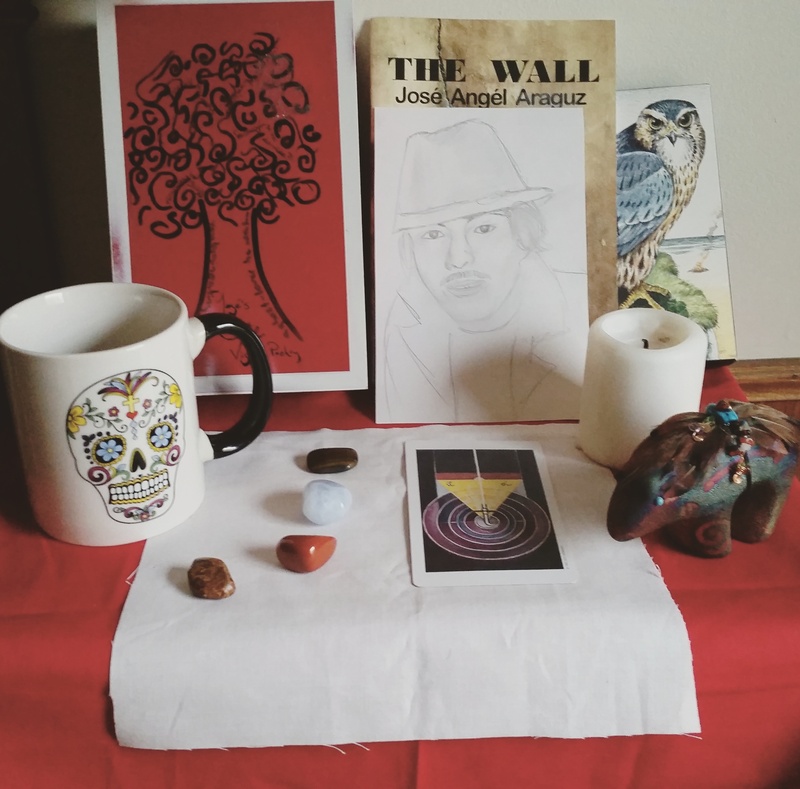 Included on the altar are a copy of my first chapbook, The Wall, and a pencil sketch of my father done by Andrea Schreiber. Also, I have my stones in a J formation to symbolize my being his namesake. I am unclear even now, days after, how to articulate what this meant for me. All I know is that the conversation that began with my poem “Gloves”, included i the chapbook, continues to this day, on the page and, now, in ritual and observance. In the Sexton poem above, what moves me is how the speaker states she is “tired of being brave” as she moves from human action to human action, all the while emphasizing what it means to her to feel human. That being human means feeling “touch entirely.” This concept is contrasted with the stone-like state of the dead. The poems is called “The Truth the Dead Know,” and the speaker’s words come from an awareness, fascination, and even fear of not being able to share in that truth. And the dead, as represented in that stone-like description, are seemingly everywhere, even in the wind. This meditation on Sexton’s poem and my own experience this week makes me think of something Norma Elia Cantu introduced me to at CantoMundo as she spoke before a reading. As she asked us to think of and express gratitude for those Latin@ writers and artists that came before us, she began to name them. Each name spoken was then followed by the exclamation of ¡Presente! As Norma went on calling names, others joined her, shouting out ¡Presente! I marveled at the act: this simple word, which is what one answers with during roll call, suddenly felt charged each time it was repeated. The very air became heated by the summoned presences everyone in the room was the conduit of. As I mentioned last week, the countdown to the December 1st release of my full-length collection, Everything We Think We Hear, has begun! Along with prose poems and flash fictions, the collection includes two haibuns, the Japanese poetic form that combines poetry and prose. As a kind of preview, here are links for “Birthdays” and “Walks” as published in Contemporary Haibun Online. Just a quick note to share my latest post for my Cincinnati Review blog column “What’s Poetry Got to Do with It?” Read the new post here. This time around I discuss astrology, focusing on Pisces and Sei Shonagon. Along with expanding on ideas on astrology I’ve shared here on the Influence, this post can be seen as a kind of part 2 to my earlier Sei Shonagon post.